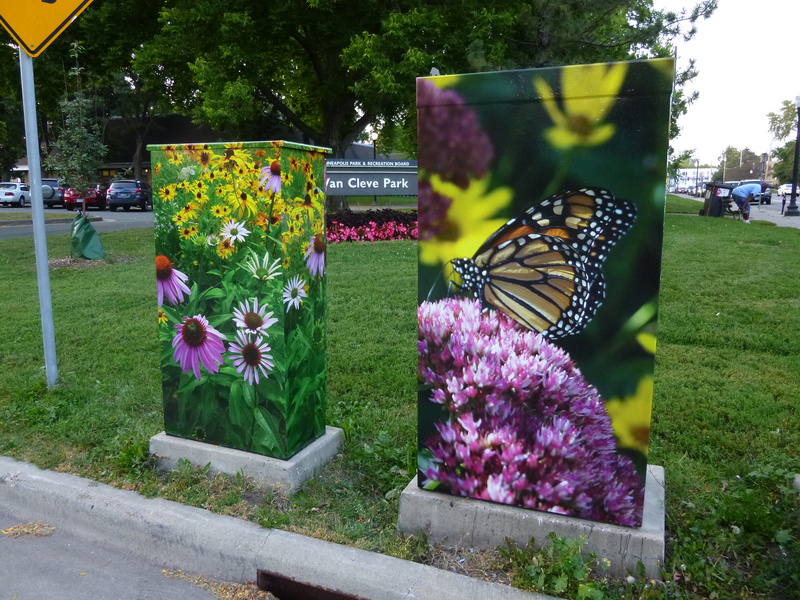 The Southeast Como Improvement Association is working on a project to wrap neighborhood utility boxes with nature photos taken by residents and printed on 3M anti-graffiti vinyl. Ugly graffiti-covered utility boxes mar our view. We wish they would disappear. Let’s cover them with nature photos and increase the bits of greenery throughout our neighborhood. Planting is an expression of hope. SE Como hasn’t a lake to walk around, but we have gardens, trees, and Van Cleve Park. Nature renews us and makes us smile. In 2015 we applied for permission from the Minneapolis Public Art Commission, Public Works and adjacent property owners to wrap five boxes, using donations from the Community. We were awarded a 2017 Good Neighbor Fund that helped us wrap four more boxes. Over 377 neighbors voted on those designs. At our Como Cookout and SECIA’s Annual Meeting neighbors began voting on new locations and potential designs for future Utility Box Wraps. In good weather we will take designs door-to-door for Community feedback. You can recommend a box for wrapping, vote on designs, submit high resolution digital photos for future wraps, and/or make a donation of any size. Wrapping the boxes costs about $15 per square foot. Depending on the size boxes cost from $400 – $1,000. Use a credit card at secomo.org or GiveMN and type Utility Box in the Tribute or Memorial box. Do you live or work in Minneapolis’ SE Como neighborhood? Have you a 16MP, 20MP or 25MP high resolution camera? S.E.C.I.A. 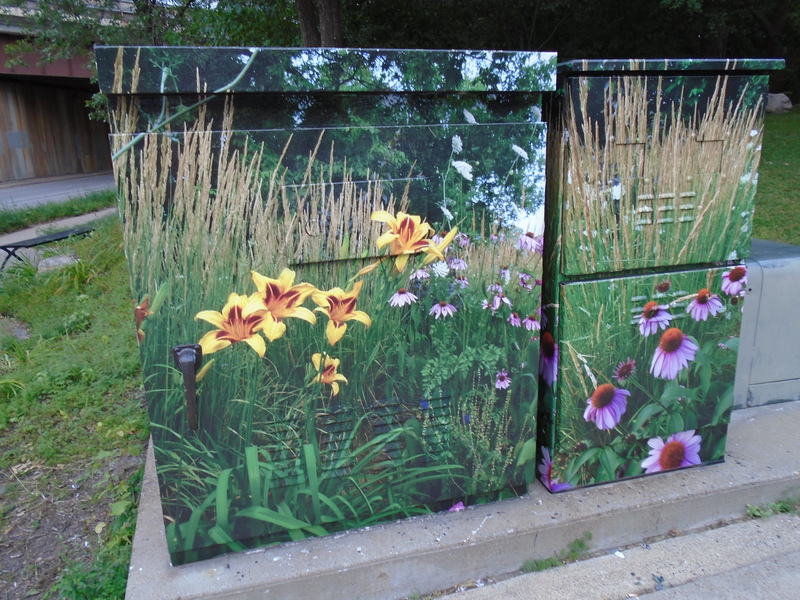 wants to cover neighborhood utility boxes with nature photos printed onto 3M anti-graffiti vinyl. You can help! Ugly graffiti-covered utility boxes mar our view. Wishing they would disappear we want to cover them with nature photos, increasing the bits of greenery throughout our Community.Planting is an expression of hope. SE Como has no lake to walk around, but we have gardens, trees and a park. Nature refreshes and makes us smile. We want local outdoor nature photos excluding people and human-made objects. Set your camera at it’s highest resolution with a minimum width of 3000 pixels. Because of the size of the boxes, photos will be enlarged quite a bit. We need raw digital photos that have not been cropped, photo-shopped, or enhanced. Photos should be taken vertically, because the utility boxes are taller than they are wide. The City of Minneapolis Public Art Board has approved five of our designs thus far. We will be wrapping some of them in the summer of 2015, but we have over twenty utility boxes around the neighborhood that we would like to cover. If you would like to submit photos for use on other utility boxes in our community, we would love to see them.